Seeds of Freedom charts the story of seed from its roots at the heart of traditional, diversity-rich farming systems across the world into a powerful commodity used to monopolise the global food system. Seeds of Freedom charts the story of seed from its roots at the heart of traditional, diversity-rich farming systems across the world into a powerful commodity used to monopolise the global food system. Seeds of Freedom seeks to challenge the mantra that large-scale, industrial agriculture is the only means by which we can feed the world. In tracking the story of seed it becomes clear how the corporate agenda has driven the takeover of seed to make vast profits and take control of the global food system. The film highlights how the loss of indigenous seed goes hand in hand with loss of biodiversity and related knowledge; the loss of cultural traditions and practices; the loss of livelihoods and the loss of food sovereignty. The pressure is growing to replace the diverse, nutritional, locally adapted and resilient seed crops which have been bred by small-scale farmers for millenia with monocultures of GM seed. Alongside speakers from indigenous farming communities, the film features global experts and activists Dr Vandana Shiva of Navdanya, Henk Hobbelink of GRAIN, Zac Goldsmith MP (UK Conservative party), Canadian farmer Percy Schmeiser, Kumi Naidoo of Greenpeace International, Gathuru Mburu of the African Biodiversity Network, Liz Hosken of The Gaia Foundation and Caroline Lucas MP (UK Green party). 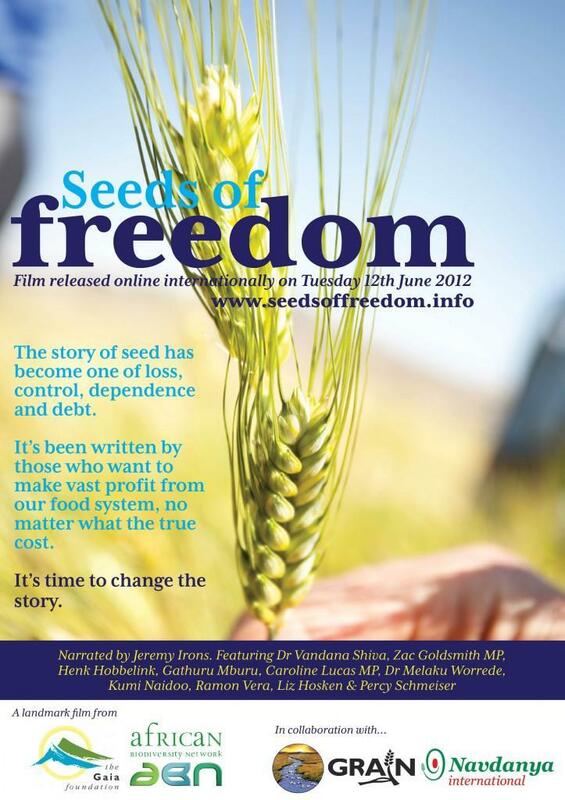 The film will be narrated by British actor Jeremy Irons and available online at www.seedsoffreedom.info from Tuesday 12th June. London Screening The Gaia Foundation will be screening the 30-minute film and holding a panel discussion in Hampstead, North London on Thursday 21st June. Find out more and book a ticket here. This film is co-produced by [The Gaia Foundation](http:// www.gaiafoundation.org ) and the African Biodiversity Network.